The people have spoken. We lost, decisively. Thousands of hours, millions of dollars, and mountains of hope and enthusiasm. Not enough. How can you not be disappointed? I certainly am, I am gravely disappointed and I want to reflect on that for a moment. When I lost the Labor leadership in 2010, I was angry and I felt wronged. I believed completely in my heart I was the right leader for the country so I promised myself I would return to the top job. I honestly, genuinely thought that I was the person the party needed. But I look back on that time now and I see that drive as something self-serving. It was more about me than it was about the party or the country. It’s obvious to everyone around me that my focus on that cost us dearly in unity and public perceptions. Of course I regret that outcome and the damage it did to the Labor brand, to the Labor movement and to the individuals I dragged in to it. I couldn’t see it at the time but I think we should have stood behind Julia Gillard. She’s a person of great integrity and her commitment to health and education was unflinching. Julia, I am so sorry. 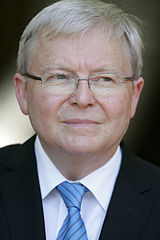 Can’t undo the decision to re-appoint Kevin Rudd. We made the wrong decision and we have to live with the consequences. I have to live with the consequences. I will not re-contest the leadership. I will see out the full term in the parliament. I will work hard to represent the electors of Griffith. But I will not intrude on the leadership or seek office. So I declare the election lost. I declare the campaign a failure. I thank you for all your hard work and I challenge you to start afresh. Be disappointed in the result. But only tonight. The Conservatives will run the country; let’s hope they do a great job. I am creating a space for you to re-invent the Labor party. Starting from scratch. Starting with your ideas and the principles of collaboration. Job starts tomorrow. Good luck.